The public spaces of our cities, such as streets, roads, squares, gardens and parks, or areas outside of condominiums and private homes can be equipped and greatly improved with the installation of street furniture or objects and functional elements such as benches, litter boxes, bicycle racks, delimitations of flower beds, lamps and light fixtures (with integrated photovoltaic panels), bollards, fountains and play facilities for children. In addition, some experiments have shown that in a context of no particularly valuable building in areas at risk of social unease, including for example the suburbs of large cities), a nice street furniture, well maintained and regularly serviced can discourage vandalism and diminish degradation, while in a residential complex it can also help increase the market value of the apartments. 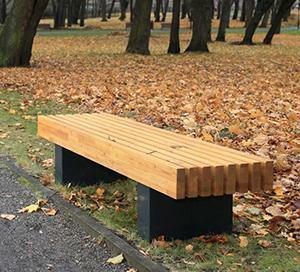 Therefore, Industrial design deals for some time even in this sector, so that a well-designed street furniture and aesthetically pleasing can significantly increase the livability and urban quality. One of the street furniture most widely used in the green areas of the neighborhood and condominium are obviously the benches, because they allow you to comfortably enjoy the outdoors to read, chat, listen to music or watch the children play. Although the variety of models available in the market is almost infinite, the production by the Company Extery is distinguished by its stylish, minimalist look. In fact, in addition to a line of benches with backrest of traditional look but revisited in a contemporary way, the catalog company offers a collection of innovative seats, including, for simplicity and elegance inspired by the Japanese style, stands the Nippon model: no backrest, with two metal feet and a comfortable seat in larch wood. It may be anchored or simply leaning against the pavement. It is available in single or double version: resulting from the combination of two benches according to the long side, it has two seats separated by a low backrest. The most innovative is the Quantum model (in the first photo), a box of plastic with rounded corners and a system of LED lights integrated. Arranging several in succession, you can create beautiful trails of light, particularly suitable for illuminating the walkways of a garden. 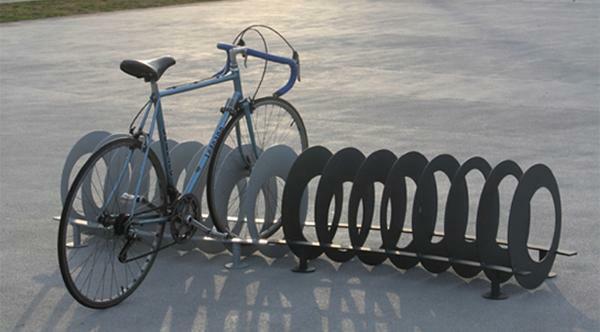 In addition to the benches, it is also appropriate to provide one or more bike racks, which, given the increased use of bicycles as a means of convenient urban transport, efficient and sustainable, now became a need for any building with several apartments . In this regard, one of the most interesting models is definitely Ola by the company CITYSI: Made of shaped steel with a laser beam, galvanized and then painted, it strucks mainly for its dynamic look due to the sequence of numerous irregular rings arranged in a serpentine pattern. 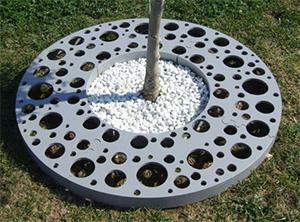 For landscaping of green areas and the protection of trees and shrubs, especially if placed near the bike paths or avenues of parks and gardens, the same company has also designed a series of treeguard or rings made of steel sheet (circular or square shape, with side or diameter up to 145 cm and available in various colors) to be placed around the plant to be protected. As shown in the photo on the left, unlike similar products on the market, their appearance is characterized by the designs to tunnel the entire surface of the article. - Dragonflies, with a series of shapes similar to this insect. To secure access to parking spaces of condos and restrict access to outside cars, alternative to the classic bar there are finally the rising bollards, generally operated with a key, a number combination or a smart card similar to an ATM. constituted by a hollow cylinder of stainless steel with a mirror or painted surface, it is equipped with a mechanism operated by a gas piston with a simple pressure of 15-20 kg. In addition, once operated, the bollard becomes invisible because fully retracted below the road pavement, while the control mechanism is contained in a metal box in a concealed position.